Adams, Henry. The Life of George Cabot Lodge. Boston and New York: Houghton Mifflin. 1911. ISBN 0-8201-1316-6. Brands, H. W. Six Lessons for the Next President, Lesson 5: Leave Under a Cloud. Hauenstein Center at Grand Valley. March 11, 2008 [January 23, 2010]. Donald, Aida D. Lion in the White House: A Life of Theodore Roosevelt. Basic Books. 2007. Hewes, James E. Jr. Henry Cabot Lodge and the League of Nations. Proceedings of the American Philosophical Society (American Philosophical Society). August 20, 1970, 114 (4): 245–255. Lodge, Henry Cabot. Treaty of peace with Germany: Speech of Hon. 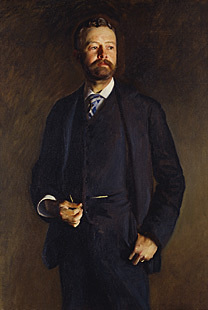 Henry Cabot Lodge. United States Senate, Washington, D. C. August 12, 1919. Rand, John Clark. One of a thousand: a series of biographical sketches of one thousand representative men resident in the commonwealth of Massachusetts, A.D. 1888–'89. First National Publishing. 1890 [20 November 2009]. Zimmermann, Warren. First Great Triumph: How Five Americans Made Their Country a World Power. Farrar, Straus and Giroux. 2002. ISBN 0-374-17939-5.